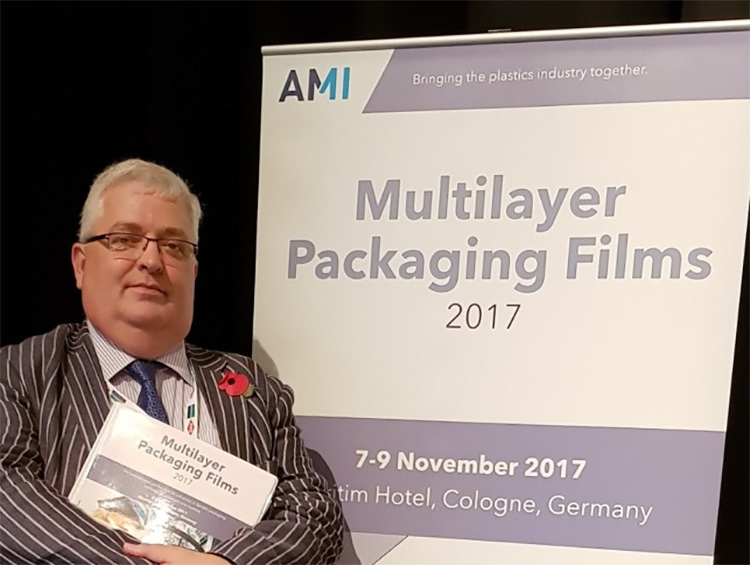 On 9th November 2017 Dr Gary Ogden, Technical Manager at Wells Plastics, presented a paper at the 10th Edition of the Multilayered Packaging Films Conference held in Cologne demonstrating how flexible laminated packaging can be made fully oxobiodegradable by utilising Reverte™. The international forum featured a 2-day programme of technical and market presentations providing companies involved in the manufacture and specification of flexible plastic packaging. At the start of his presentation, which overall received a warm reception from the audience, Dr Ogden took the opportunity to clarify some misconceptions and misinformation out in the market concerning oxo-biodegradable packaging the most recent example of which has appeared under the guise of the registered charity The Ellen MacArthur Foundation in their statement paper via The New Plastics Economy. This particular statement flies directly in the face of the recent findings in the EC commissioned report by Eunomia into Oxobiodegradable technology, in addition to significant third party independent test work that Wells Plastics has conducted on its own range of oxo-biodegradable materials, marketed under the trade name Reverte™. Dr Ogden proceeded to present the well-established science behind Reverte™ oxobiodegradable technology showing delegates at the conference the very latest independent third party test data, which was the culmination of over five years work, for polyethylene (PE), polypropylene (PP) and polyethylene terephthalate (PET), which are primarily used for manufacturing laminated flexible packaging. Wells Plastics has completed testing of multilayer laminates made of PET, BOPP, MET PET, MET BOPP, PE films incorporating Reverte™ in all the layers and it has now been well proven that multilayer packaging incorporating Reverte™ will oxo-biodegrade if these items end up in the open environment.